Ascend Cycle — Sign Up for the July Fit Challenge! Sign Up for the July Fit Challenge! Sign up for our 2nd annual summer challenge! We know its tough to stay on track, so we're here to keep you motivated. With three different challenge levels, the more classes you take, the bigger prizes you'll win! Log on to your Ascend Cycle account to sign up. See the step by step details below. Sign up and take your classes! The challenge includes BOTH rides and classes in Ascend Underground! The challenge starts now! We start crediting your classes as soon as you sign up! Track your progress in your account, and when you hit your goal - you WIN! 16 Classes: Limited edition AC challenge shirt + 1 entry to win our grand prize swag bag! If you take 16 or more classes this month, you will be automatically entered to win an AMAZING SWAG BAG, filled with gifts from local Del Ray and Old Town businesses. The swag bag includes: 5 classes at Mind the Mat, $50 to Mia's Italian Kitchen, $20 and a tshirt at Stomping Grounds, and MORE! Login to your AC account. 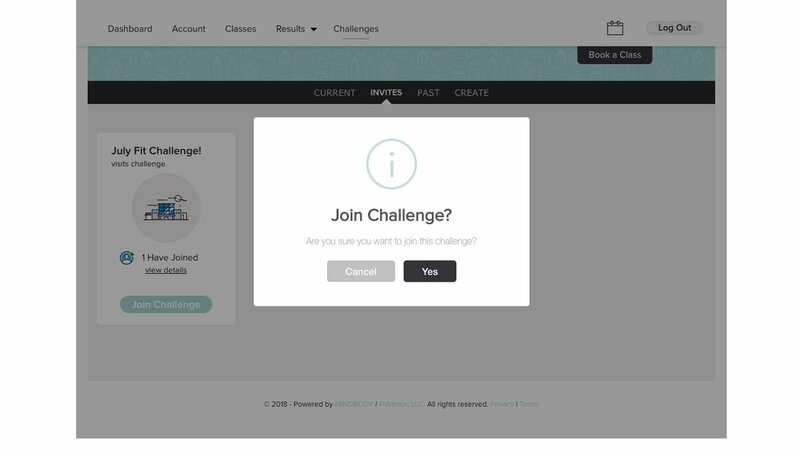 On your account menu, find the button for Challenges.